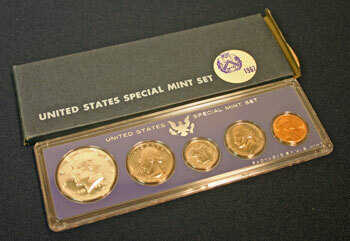 The 1967 Special Mint Set looked very similar to the previous year's set. A dark blue box held a hard plastic lens with the five coins positioned in individual circles. 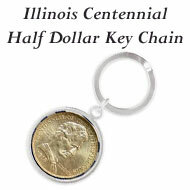 Only the half dollar in the 1967 special mint set contained any silver at 40%. 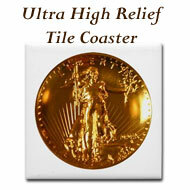 In addition, the mints struck coins without identifying mint marks in 1967. 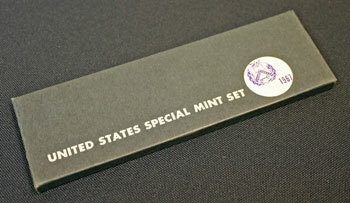 The box for the 1967 Special Mint Set looked similar to the previous year's set but a darker color of blue. The long narrow box included "United States Special Mint Set" on the front with a white sticker showing the US Mint seal and 1967. The back of the box looks almost gray, but it is a dark blue, and did not include any additional identifying marks. Opening one end of the box allows access to the 1967 Special Mint set. Like the previous year, the 1967 Special Mint Set held each coin separately in its own circle of plastic within the clear lens. A brighter blue plastic with individual circles for the coins provided a background. 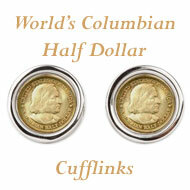 The coins were arranged from the largest to smallest denomination. 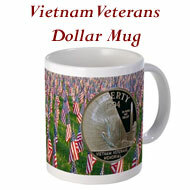 At the top, a silver colored heraldic eagle resides between "United States" and "Special Mint Set." In the lower right corner, "Packaged by US Mint" is included. 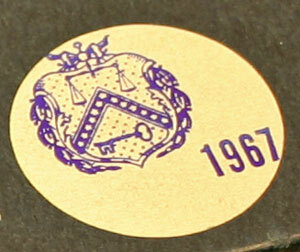 For a close-up view, the sticker on the outer box includes the inner portion of the Treasury Department's seal for the US Mint along with "1967" to identify the special mint set. The 1967 Mint Assay Commission looked at various coins produced by the US Mint as ordered by the Congress in 1792. The presidentially appointed group weighs and examines random samples of the coins, though with improved processes, the process is more ritual than necessary. Representative Frank Annunzio of Illinois introduced a bill that would allow the Mint to re-instate the "D" mint mark which disappeared on the coins after 1964. 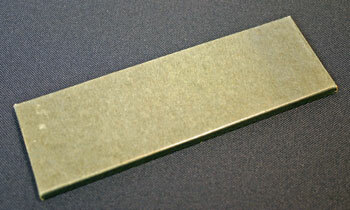 The column provides a simple and concise discussion of Mint Marks. 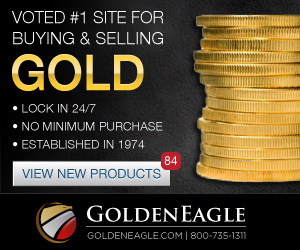 the largest customer, ordered 1.7 billion coins between 1941 and 1946. For example, the mint produced Polish zlotys, French francs, Saudi riyals, Syrian piastres and Siamese satangs. 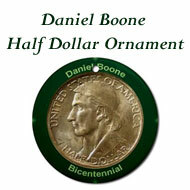 The Mint placed mint marks on these coins similar to those on US coinage. illegal to melt or export silver coins. Starting with tongue-in-cheek, the article claims the mints withstood fire, earthquake and rebellion but were almost brought to their knees by the parking meters and vending machines. 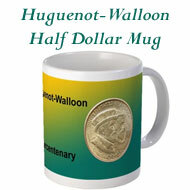 At a high level, the origination of the mints and President Washington's contribution of family tableware for the first minted coins are outlined. In their history, the article described the rise and fall of the gold and silver mints along with the San Francisco Mint's importance after the 1906 earthquake. With progress, the new Philadelphia Mint's automated processes will turn out 10,000 coins a minute. 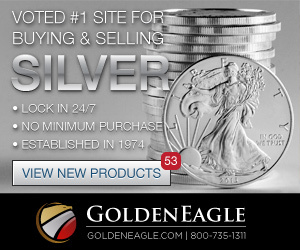 The New York Mercantile Exchange announced it would start spot trading silver dollars on Aug 21. 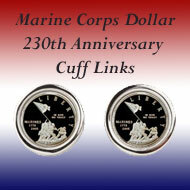 One contract will be for uncirculated silver dollars and one for circulated. Both contracts will be for either Peace or Morgan "common date" silver dollars. 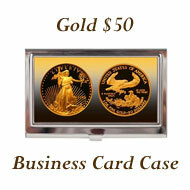 The $1000 face value coins will be loose in a canvas bag like those used by the US Mint. The Treasury Department confirmed their plans to melt regular silver (90% silver) coins minted before 1965 starting at the end of the year (1967). 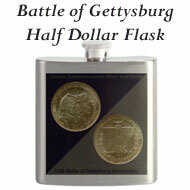 Since removing the ceiling on silver prices, the government wanted to control speculation with the metal. 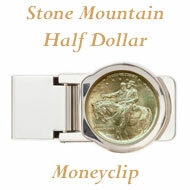 By October, the Mint had collected 150 million ounces through old coins. But, there was no plan for the Mint to keep records of which coins would be melted making the numismatic hobby more challenging. Per the Mint Director, they have slowed the production of the Kennedy half dollars. 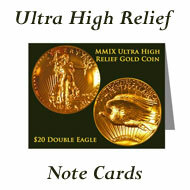 The coins are not readily found in circulation and rationing still occurs through the Federal Reserve Banks. Some think the hoarding of the halves is due to the likeness of the late President Kennedy. Others think people keep them for their silver content, being the only coin minted for circulation with any silver content. Another theory is people don't circulate them due to their size and weight. But, according to the Mint Director, the coins will continue to be minted. Lynda Bird Johnson's wedding to Charles Robb would be at the White House the following weekend. Though recently from Wisconsin, Charles Robb's family originated in Virginia. His great-grandfather was the last Secretary of the Treasury for the Confederacy. His maternal grandfather, Robert Wickliffe Woolley, was a director of the US Mint. The 1967 Special Mint Set Year included news about mint marks, coin shortages, silver coins and the circulation of the Kennedy half dollar coins.